Date Night in a Bag and a MEGA SALE! Last year, I created a product called Date Night in a Bag. 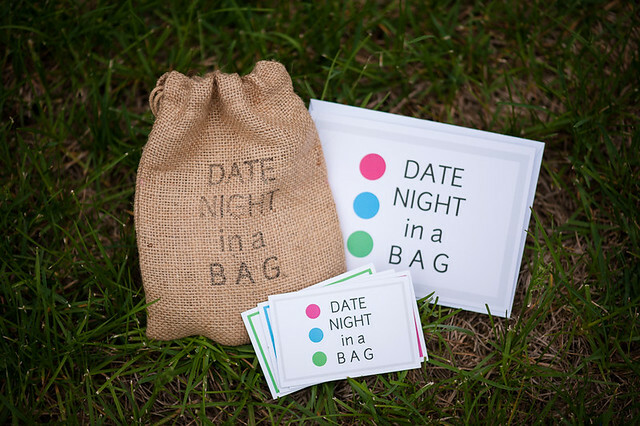 It includes 25 fun date night ideas in a burlap hand-stamped bag; perfect for a wedding or shower gift, or for yourself! I am currently in the process of working with a designer to give Date Night in a Bag a breath of fresh air. BIG things are in store for the future, and I can't WAIT to show the final results of our collaboration and hard work. Things are moving way beyond just this one product too. Good things are in store! In order to move my inventory of original Date Night in a Bag sets, for a limited time, they are available at nearly HALF OFF! For a limited time, they are available for only $15.00. Visit www.datenightinabag.com for more details or to purchase your sets. There are only 20 original sets left, so if you are interested in buying a discounted set before the new ones are revealed and the price goes back to normal, move quick!